Your donations go towards supporting the growing demands for the program and the expansion of our impact and reach. Each year in the US, about 67,000 autistic children turn 18. Sixty percent or about 40,000 have no or only a mild level of intellectual disability. They are capable of higher educational and employment outcomes. Only about 23,000 enter a 2 or a 4 year college and most of them do not disclose their disability to the college. Of those that disclose, about 2,600 graduate with an Associate or bachelors degree. We do not know how many graduate without disclosing. Nor do we know how many of them end up in paid employment. What we do do know is only 14% of all autistic adults have a paid employment in a community integrated setting. Over the last two years, we have conducted multiple workplace readiness program sessions with an average of eight students per cohort. The overall completion rate for these cohorts is 93% and we have placed 64% of our alumni in hiring companies throughout the country. We feel confident that our mission is vital and our approach has meaningful traction. Accelerate the employment placement rate of neurodivergent individuals and grow our relationships with hiring organizations by expanding the functional talent of the Neurodiversity Pathways’ team. Extend our geographical and physical presence to reach more and more individuals, partners, and hiring organizations beyond Northern California. Grow the program’s scope to include support for neurodivergent individuals in a variety of life stages, including as they enter the college. Enhance the learning experience of our program participants by continuing to upgrade our facilities, our curriculum, and our tools of technology. To accomplish this growth and significantly broaden our social impact, we need to raise $1M by end of December 2019. Your support helps make more and more neurodivergent individuals reach their fullest potential and be seen, heard, and known in the workplace. We have received a very moving letter from a couple who has offered to match donations made to Neurodiversity Pathways. 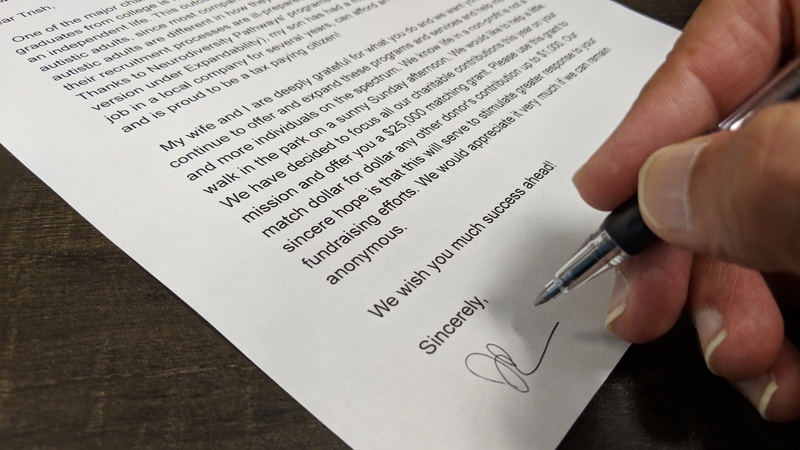 While the donors are requesting to remain anonymous, they believe strongly in our mission and are personally grateful for the impact our program has made in their lives and the life of their son. As parents of an autistic child, they were concerned about their son’s future. Would he find rewarding and sustained employment? Would he be able to live an independent life? How would he realize his potential and live his fullest life? Well, today their son has full-time meaningful employment, is living independently, and is proud to be a taxpaying citizen. His parents attribute his success to our program and services. The couple has offered to match dollar-for-dollar every individual donation, up to a total of $25,000. Please contribute now to our mission and double your donation. The matching challenge begins now and continues through December 31, 2019. Neurodiversity Pathways is a social impact program of Goodwill of Silicon Valley, which is a 501(c)(3) nonprofit organization. Your contribution is tax-deductible to the extent allowed by law. No goods or services were provided in exchange for your generous financial donation. Please keep this written acknowledgment of your donation for your tax records. Please consult with your tax advisor or the IRS to determine value of your tax deductible contribution. Thank you for your contribution.